I've never been particularly attracted to begonias as such but I realise that several of the plants that performed particularly well for me this summer are members of this huge variable genus. 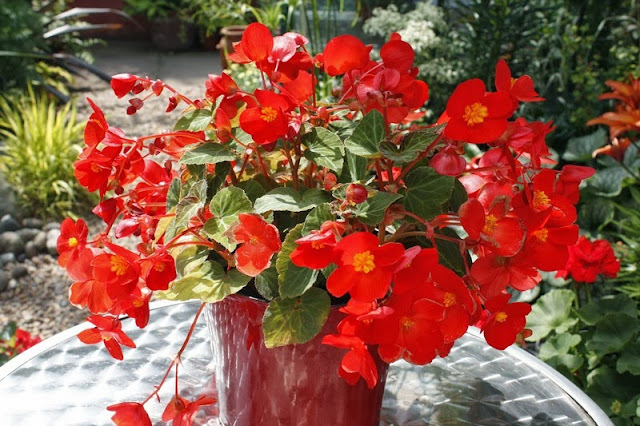 Earlier in the summer I bought a plant of Begonia 'Flambouyant', with single red flowers. 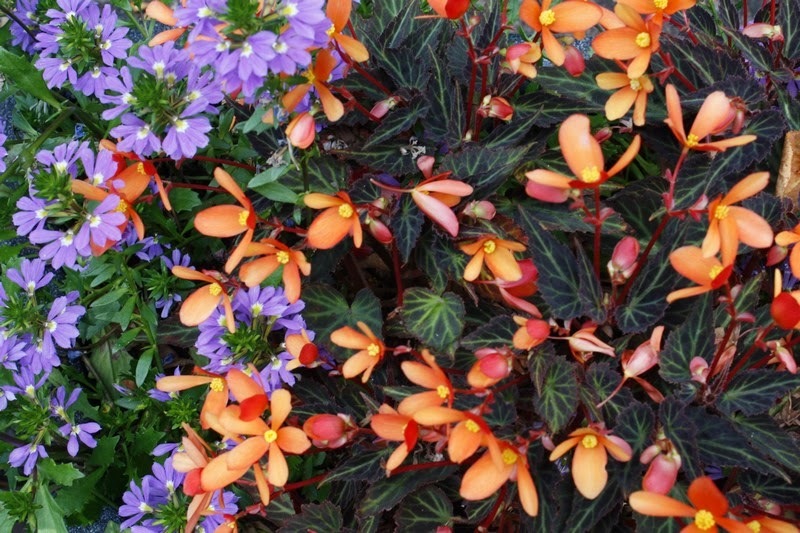 I had intended to put it in a group in a terracotta urn I have but I had mistaken the size of the conatiner and bought far too many plants, so the begonia stayed in its pot and graced my patio table. It flowered profusely for many weeks but eventually ran out of steam. I guess if I'd have potted it into a bigger container it may well have continued but it was still good value for those weeks. 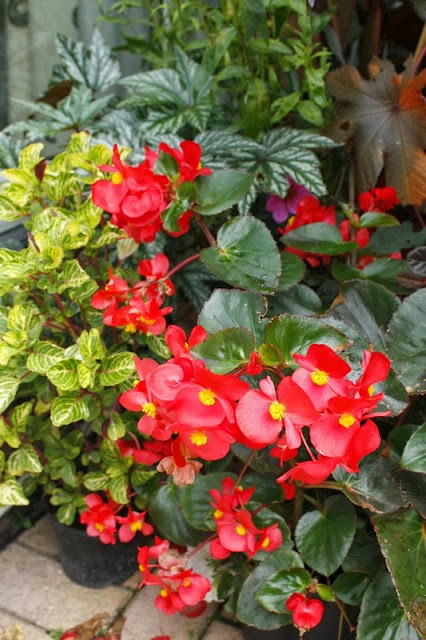 In a similar colour, (yes I do like bright red) I also purchased a plant of a glossy leaved semperflorens type. It wasn't labelled 'Dragon Wing' but it had a similar lax habit. This has continued to flower and is still now full of colour. I also had 'Glowing Embers' which was pretty but less vigorous with me. Begonia 'Glowing Embers' - another year, another place! I have previously mentioned the foliage Begonia 'Gryphon' which has done well in a shady corner but clearly viewable from inside my patio doors. 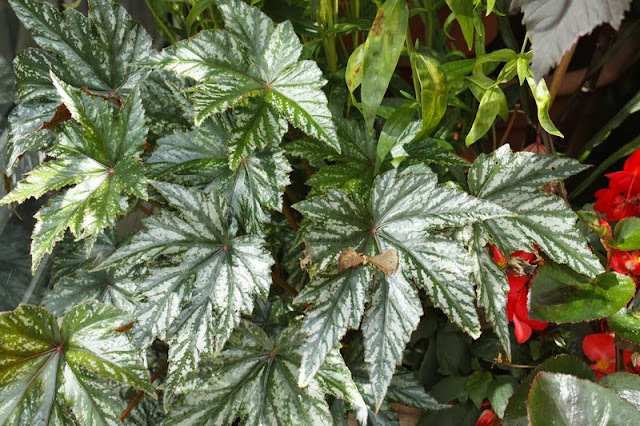 Needing another houseplant some weeks ago, I bought a foliage begonia from the Dibley's range in our local garden centre. 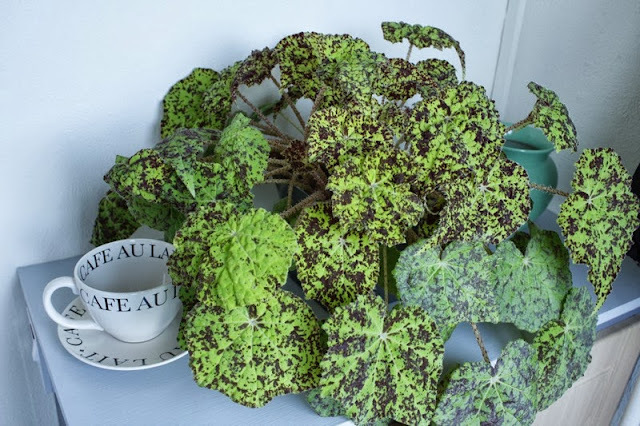 It has hairy lime green leaves freckled with chocolate spots. This has absolutely thrived in my north facing porch and covered the cabinet it sits on. Checking Dibley's website, I think its probably 'Marmaduke'. Planting next year's garden seems an eternity away and by then I shall have forgotten all about this year's successes and resolutions. Better make a note for myself to plant more begonias next year! It's been a decent summer and some of the bedding begonias we planted last year came back this year.